buynow/bloglater: Quick OOTD...and Zoya giveaway winners! Quick OOTD...and Zoya giveaway winners! What a slacker I have been about announcing the winners for this contest! I do apologise and if I could pluck out an excuse it's that I like to try and draw the winners fairly, deleting dupes from an entry list list and then using a tool like random.org to select a number that then coincides with the list.....etc. Email me your details ladies - buynowbloglater@gmail.com - and I will get the sets out to you! Now onto the OOTD! This was not worn today but earlier this week at an event held by theoutnet.com. It was actually "cold" in Dubai terms and there was talk about needing a hot chocolate to warm up. To be clear it was about 18 degrees celsius outside - ie, not cold. I wore my very favourite top from ASOS and if you can keep a secret...I have worn it three times this week. It was not a good idea to pair the bag with this outfit. I knew in advance that I would need to hold it away from my jeans at all time in order to prevent denim transfer. Keeping a 2 inch minimum space between bag and jean makes you look stupid and feel awkward. Love how flowy the ASOS top is! I love the look of dark denim but it's such a pain to have to worry about color transfer! Whenever I use my Balenciaga first bag in Sahara, I always have to double check my outfit to make sure no transfer will occur. I usually end up substituting my olive skinnies for dark denim as its color doesn't rub off so far (fingers crossed!). Haha, actually LOL'ed when I read it was 18 degrees there! Mmh.. 18 degrees.. If we could just have 15 degrees in Germany now I'd be forever grateful! I'm sick of snow and the cold!! Lovely to see your fotos though, always gives me this little summery feeling :) Thanks! Haha, I can't even imagine drinking a hot chocolate in 18 degree weather... way too warm for that! Last season Siwy had some super cute white jeans that I'm majorly regretting not picking up. Maybe they have a similar pair now? your hair is looking amazing! hehe we are all guilty of re-wearing an item of clothing over and over in a short space of time - it looks fabulous on you! You look wonderful, beautiful color bags!Welcome to yourself! Not sure if they have J.Crew in Dubai, but J.Crew makes some of my favorite jeans of all time. I have 3 pairs from them (coral, mint, and white) and am currently on the hunt for a black pair. I love the pop of color the bag gives to this outfit! Start your white jeans search in Zara- cheap, loads of different finishes and they wear vvvv well! I love the pop of colour with your yellow Celine, so gorgeous!!! So gorgeous, LOVE the bag! Flawless, as always, Laura. Beautiful post! You should look into Massimo Dutti for the perfect white jeans. I love the blazer and the handbag! So amazing. i love the colour of your bag! Love the looser peplum shape so much, I'm going to have to check ASOS out because I've been looking for something exactly like this! Your bag is perfect, I'd be so extremely careful with it too if I owned a Celine. Try Zara for white jeans, I find they always fit really well. You are gorgeous, I love the asos top! The outfit is gorgeous- and your bag is, oh my... so beautiful! 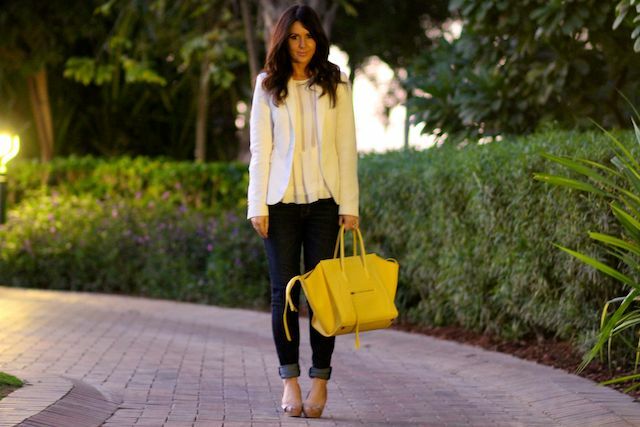 your celine bag is completely gorgeous especially for spring! love your outfitt so pretty!!! that bags to die for! !